he Clan Donnachaidh Society was inaugurated at a dinner in Edinburgh in 1823. Struan (the chief) was in the chair and his deputy was Capt. Duncan Robertson of Kindrochit who substituted for General Robertson, Struan’s heir. The Chief’s piper piped and Nathaniel Gow, son of the great Neil and almost as distinguished a musician, provided the band. Nine months earlier Gow had entertained the king at Dalkeith House. Of the Clan Donnachaidh names, James McInroy, descended from the Reid-Robertsons of Straloch, was son of an Atholl farmer. He made a fortune based on West Indies sugar and bought Lude under the nose of the Duke of Atholl. The MacInroys also bought Shierglass, the estate on the opposite hillside across the river Garry, and held it until 1939. Auchleeks was sold out of the Clan in 1962, Edradynate in 1969, Kindrochit in1883, Blairfettie in 1821. Auchanree in Glen Errochty and Allain on Loch Tummel were owned by the Duke of Atholl by 1826. There was another Clan Donnachaidh lunch in Edinburgh in 1824. 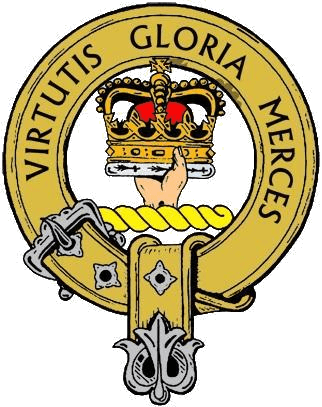 By the following year this had developed into the Clan Donnachaidh Society with activities also taking place in Glasgow and at least one overseas member in the shape of Dr. William Robertson in Montreal. The last formal dinner of this earliest incarnation of the Society seems to have been held in 1842. The outstanding funds were turned into a trust and used to pay the schoolmaster of Struan and today the trustees, direct descendants of the cadet families of Kindrochit and Invervack who were instrumental in founding the Society, still support the school at Struan and others in Highland Perthshire. The Society continued in a desultory fashion and was re-formed in 1893 with district secretaries in Canada and Australia as well as throughout the UK. Life members came from across the British Empire as well as New York, Chicago, North Carolina and New Jersey. With the enthusiastic support of the 20th Chief the Society met annually and flourished until 1914 and the catastrophe of the Great War. It continued in a truncated form between the two wars with Clan dinners being held in various Scottish towns but it sprang to vigorous life again in 1948. A Guarantee Company, affording limited liability, is often referred to as a ‘not-for-profit organization’. As such, it is ideally suited to many charitable and community initiatives, where its purpose and assets remain in the charitable or community domain, rather than in the hands and ownership of individuals.